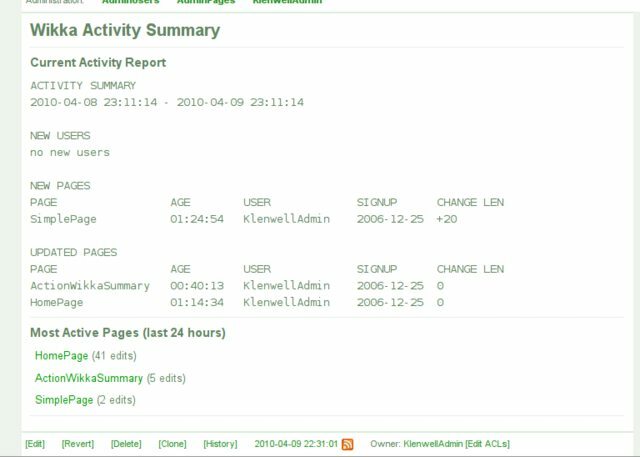 The Activity Summary Action has three different modes: Viewer, Admin, and CLI. An ordinary viewer looking at it in a browser will see the most actively edited pages for the period, as demonstrated here: klenwell.com. An admin will see that as well as a plain text report, as in the screenshot below. And in CLI mode, a plain text report will be emailed to a specified set of addresses. This release is still somewhat unstable. It has been well-tested, but only in a limited number of environments. There may still be some undiscovered minor issues. Constructive feedback is appreciated and will be used toward preparing the v1.0 release. Issues can be reported at my Google Code Issues page or in the comments below. The files are all included in the download package.